Have we reached the verdict regarding our future? Was George Orwell right? Has the big brother been watching over without us know, as if we were citizens in a global silent dictatorship? And what about the social networks, are those enough to be considered as the beginning of a certain end to our healthy minds? Too many questions and plenty of answers, maybe some would be left in the air for sure. Possibly the only thing left is tell about it, warn the commonwealth of probably future's dangers and hazards. Under the veil of melodic Metal, the Bavarian POWERWORLD created various perceptions of the future to come. Several views have been seen in movies over the years, others have been preserved for impending use, maybe to write songs about. 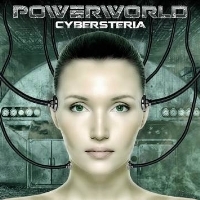 POWERWORLD created the next revolutionary hysteria of the cyber world with their brand new album, "Cybersteria", via SPV / Steamhammer Records. Nothing too innovative musically, but this album, as the previous before it, is enough to encourage the listener to appreciate the band's profound talents for their version of Heavy Metal. "Cybersteria", as the band's new album, served also a cornerstone for the change the engulfed the group. In 2011, after suffering from a continuous illness and bad health, the band's previous vocalist, Andrew McDermott, died. David Reece, known from his single work with ACCEPT and a constant member of BANGALORE CHOIR, stepped in as a replacement. Yet for the reason of musical differences, the ex-JADED HEART Bluesy voice of Michael Bormann, took charge of the vocal recordings. Furthermore, Guitarists, Andreas Rippelmeier (HEAVENWARD) substituting for Barish Kepic, and Keyboards players, Marco Grasshoff coming in for Nils Neumann, were replaced for the recording, possibly as new band members under the leadership of bassist, Ilker Ersin. In comparison to the previous "Human Parasite", this has been quite an uplifting experience, as this unified group generated a decisive, partly intricate and complex, concoction of Euro melodic, but heavy duty, Heavy Metal in range of ACCEPT or VICTORY, Bluesy furbished Hard Rock of whether 70s DEEP PURPLE and 80s WHITESNAKE, aside to a variety of Power Metal attributes of STRATOVARIUS and darkened features of EVERGREY. Not what I would call an explicit musical skirmish, but surly this particular one is a fresh air in a cool summer night. "Cybersteria" enabled smooth catchiness just as the previous release, yet the dimmer veil that hovered above of the Blues created an atmosphere of something that might resemble sorrowfulness and emotional distress. One might also notice fear, especially within the theme of the lyrics, and Bormann's raspy tone of Jorn meets Coverdale tone of voice seemed to be the right choice to go along with. The album's rising star, "Coast Of Tears", is an aching, hooking, slow to mid tempo rumpus of emotional distress, a slight murky, powerful riffing and impressive vocals, reminded me a bit of EVERGREY but with a bleak PURPLE aloofness. "Back On Me" seemed endless at first, but ended up being highly articulate and melodic. Similar to "Human Parasite", POWERWORLD remained modernly produced in terms of sound, but for songs such as this one, nothing sounded as better. "Not Bound To The Evil" and "Like A Shadow" drenched in 80s Metal boundaries. Andreas Rippelmeier seemed quite capable of writing past oriented riffing. There have been several signatures of the 80s throughout the album, but these songs took me back to the hey days more than the others. The latter being a catchy speedster with an amazing main riff, a mere classic with an incredible lead guitar line, but with an even better was the vocal line. There you have it, dripping with the right volume of Blues, along with an expressional version of melodic Heavy and Power Metal, the pristine hysteria is delivered and here for your receiving and understanding.